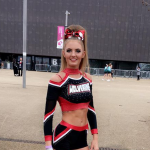 Kayleigh has been involved with All-Star/University Cheerleading since 2010, earning her a wealth of experience as both an athlete, coach and judge, having competed and coached all-star teams nationally with great success as well as coaching in local schools. After joining Basingstoke Wolverines as Head Coach in 2015 her vision and drive has seen Wolverines go from strength to strength with the programme now fielding over 130 athletes, 9 competing teams from Mini to adult at Levels 1-4. Her expertise in coaching and well known reputation for highly innovative choreography, resulted in the Wolverines winning multiple divisional titles as well as 2 national titles in her first full season with the Wolverines in 2016-2017. One year later a further National Champions win, a Battle of Champions win and the programs 1st Summit Bid (World Championships) invitation proved the continued growth of the program under her direction. Kayleigh has a passion for cheerleading, which is infectious and flows through to every athlete in the programme. A truly inspirational coach who always achieves the full potential out of every one of our members. We are excited to see what the future holds for Wolverines under Kayleigh’s direction. Kayleigh is qualified in USASF levels 1-5 stunts, tosses and tumble.